Chicken, quail, duck, goose and turkey eggs are the most common egg varieties eaten around the world. And while one variety is preferred to all others in different regions, all five have become available essentially everywhere in the last years. Getting to choose from different types of eggs is great, but it also raises the question which egg variety is healthiest. Depending on which nutrients in particular you are looking to get from eating eggs and any dietary restrictions that result from existing medical conditions, one of these 5 different types of eggs is better for your health. There are many aspects to consider when it comes to deciding which egg variety is the most nutritious and the healthiest for you. For example, if you have diabetes, your doctor has likely asked you to reduce your intake of fats. What this means is that duck and goose eggs are not the best choices for you because they have a high fat and cholesterol content. But if you have a pronounced vitamin B12 deficiency, then you would benefit more from eating duck and goose eggs than any other variety as both are the best sources of the vitamin of all five egg varieties. The idea is you have to consider any existing health issues and the dietary and nutritional restrictions they come with. Based on this you can then compare the nutritional value of different egg varieties and choose which egg is best for you. Because the best eggs variety is the one that is the healthiest for you and only you. The second most important aspect to consider is how many eggs you should eat per week or a day. Some people may eat two eggs a day almost every day. Others may eat eggs occasionally or infrequently. There is really no correct answer when it comes to eggs per week recommendations. One thing nutrition experts do agree upon however is that excesses are never good for your health. A general recommendation says it’s best not to eat more than 2-3 eggs a day and try to go several days without eating any every once in a while. If you need to lose weight and have medical issues caused by excess weight, than eggs should be an infrequent part of your diet and you should exclude other sources of fat, especially processed foods, before introducing eggs so as to maintain a balance. Eating only the egg white is a good solution only if you are looking to get more quality protein and cut down on calories to lose weight. Know that egg whites are essentially devoid of vitamins, minerals and fats and cholesterol which are, after all, essential nutrients. It’s actually the yolk that holds most of the nutritional value of the egg. 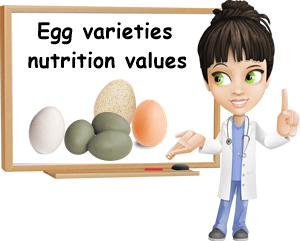 Below are the nutritional values of 5 different types of eggs: chicken, quail, duck, goose and turkey (see their health benefits on the egg page). By comparing protein, fats, carbohydrates, calories, vitamins and minerals you should be able to tell which of the 5 is the best choice for you. Weight: 1 whole quail egg has roughly 9 g.
10 whole quail eggs weigh 99 g.
Weight: 1 whole goose egg has 144 g (medium-sized egg). Weight: 1 whole turkey egg weighs 79 g.
This is considered a medium-sized egg. The younger the hen, the smaller the egg. The older the hen, the larger the egg. – Chicken eggs are the most balanced in terms of nutritional value with neither a too low a vitamin and minerals profile, nor a too high calories, fat and cholesterol content. – Duck eggs are the best egg varieties in terms of vitamin B12 and vitamin B9 content. – Goose eggs are the second best source of vitamins B12 and B9. – Chicken eggs are lowest in cholesterol. Goose eggs are highest in cholesterol. – Duck eggs are presumably richest in choline, as indicated by their high trimethylamine content which gives them a particular fish-like taste. – All egg varieties have no fiber and no vitamin C.
– All varieties are important dietary sources of B vitamins. – Out of all varieties, goose eggs have more protein, closely followed by turkey eggs. – All varieties are satiating, nutritious for the brain and muscles, boost energy levels and are good for pregnant women. – The shells are rich in calcium. The yolk contains almost all nutrients, fats and calories. The egg white is mostly protein. – Quail eggs have more yolk than egg white compared to chicken and other varieties. – Quail eggs are considered less allergenic than chicken and other varieties. However, anyone with egg allergy should avoid all varieties. So when you ask yourself which egg variety is the most nutritious, known that all of these five different types of eggs have a similar nutrient profile, with a few exceptions, and are all good for health. Provided, of course, they are eaten in moderation and not every single day. And the egg variety that provides the best nutrition for you is also the healthiest.